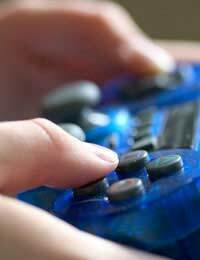 Video games – are available in the High Street shops, there are shops solely devoted to them. The biggest of them, like Grand Theft Auto, became known far outside any gaming community, as much for the controversy surrounding the violence in them as for the amount of money they generate in sales. Video games have come a long way since the 1970s, when they really began. In 2007 the video game industry was worth over £19 billion globally, and estimates predict this will reach almost £25 billion by 2011, surging ahead of spending on music. That’s a huge chunk of entertainment money. There were computer video games in the 1960s, but computers were so rare and so large that they were strictly for academics. The first arcade video game, Computer Space, was released in the US, but it was Pong, a version of table tennis that was a hit the year after. What became known as the Golden Age of arcade gaming arrived in 1978 with Space Invaders, followed by a number of imitators. Soon these and similar games were available as cartridges to work at home with early games consoles in the US. The first huge hit was Pac-Man in 1980, which brought kids into the arcades, and with the advent of home computers, games as entertainment for them became the norm, and by the late ‘80s it was possible to play games online – the decade also saw the first handheld gaming devices from Nintendo. But it was in the 1990s that video games really began to take off, especially on computers, as technology advanced, with strategy and adventure games, and the first instalment of the Sims – SimCity - as well as the first person shooter, or FPS games, which remain wildly popular. Sega and Nintendo introduced video game consoles and Nintendo brought out its handheld Gameboy – a unit that stayed popular for a staggering 15 years – as well as its Nintendo 64 console. Sony entered the market with its Playstation. But it’s really since the turn of the Millennium that the video game industry has become a entertainment juggernaut, with Sony Playstations 2 and 3, Microsoft’s Xbox and Xbox 360 and most recently the phenomenal success of the Nintendo Wii, ushering in the era of casual gaming. You can play games on consoles hooked up to the TV, on computers, and on several competing handheld devices. Where titles were often exclusives to one console – and some still are – video games have become a big enough business that game publishers now issue their titles across all platforms. This maximises revenue, which can be important when games cost a small fortune to develop, as many do these days, with highly elaborate graphics, special soundtracks and often complex stories. The gaming community, which once primarily consisted of young men, has expanded wildly across gender and generation, especially since casual gaming exploded as a major entertainment form. It’s to the point these days where it’s rare to find a home without at least one games console, as well as others for the computer – or someone taking part in multiplayer online games like Second Life or World of Warcraft. It’s not simply the games themselves that bring in a lot of money. The consoles, too, are important, with queues of those eager to buy the latest. There are now games that can be downloaded direct to consoles, downloadable game add-ons, and consoles also function as DVD players. Soon it’s quite possible that the games console will vie with the computer to become the home entertainment hub.